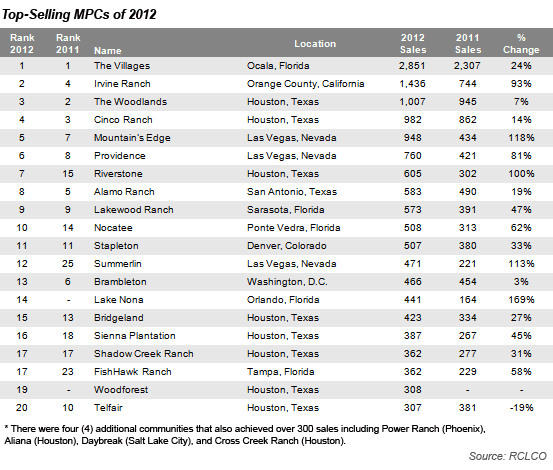 Year-to-date 2012 home sales at top master-planned communities (MPCs) are the strongest in three years, up sharply over 2011. It appears that the recovery has finally come to MPCs. Every year since 1994, RCLCO has conducted a national survey identifying the top-selling MPCs, followed by in-depth interviews among the top 20 to reveal the trends behind the numbers. Although our research shows that sales in 2011 were not universally stronger than in 2010, most MPCs report that year-to-date sales for 2012 are up substantially. A majority of the communities are optimistic that this is a trend, not a blip. Most of the top-selling MPCs report that in 2011 and early 2012 they are seeing a deeper buyer pool with better credit. Buyers that have been sitting on the sidelines for the past few years are feeling more secure about buy- ing, and they’re back in the market now that the future economic outlook seems a little clearer. Meanwhile, MPCs are also finding that they’re competing with a lower volume of short sales and foreclosures in their projects compared with last year. In 2010, sales were starting to improve but there was no confidence that a good month or two of sales indicated a trend. In 2011, the pattern of consistently improving sales became more pronounced, and 2012 has been even stronger. In 2011, there was an even stronger flight to quality than in 2010, pushing MPC market share higher as both builders and consumers believed MPCs were safer places to invest in lots and homes. Now those buyers are showing up in greater numbers. It’s important to look at both the circumstances behind increased sales and the proactive strategies par- ticipants have employed to bolster their sales. Certainly the improving economy and job growth are major factors, with communities near job centers noting the correlation between their sales and employment growth in those areas. However, through our interviews RCLCO has identified key themes that have led to the success of the top-selling MPCs that are worth considering for MPCs that are still struggling to recover, as well as for future planned communities. Admittedly, some of the critical success factors (such as being a mature community) cannot be replicated by new MPCs, but many indicate what it takes to succeed in the current environment. This article focuses on some of the key strategies MPCs have used that we believe will help other existing and new MPCs be more successful as the market recovers. Although there are many things master-planned communities have done to enhance their success, it’s rare that success happens overnight. In fact, all of the top-selling MPCs started before the recession. In many cases this allowed them to realize a level of critical mass in terms of product in place, landscaping, and amenities, and a prior track record of success that helped both their builder customers and homebuyers feel more secure about investing in the community. Their low land basis from having purchased the prop- erty pre-real estate boom also gave them more pricing flexibility. Many of the best-selling communities also have favorable locations relative to major job centers. That may be harder to replicate in the future, at least at a large scale, given lack of available land near job centers in most major metropolitan areas. However, new developments can include a broader range of commercial uses and incorporate a job center within the project. It’s also likely that these new communities will be smaller in scale on sites that enjoy closer proximity to existing job centers. Although there has been less family-oriented household growth in recent years, new and existing families are still one of the most important market segments for MPCs. Therefore, being close to, or including, good schools remains one of the keys to high sales. MPCs influence school quality by choosing locations where good schools already exist, or through providing sites for new schools, facilitating the creation of charter schools, or recruiting private schools. We’ve also observed that as quality MPCs attract new families into existing schools, test scores (viewed by many buyers as a measure of school quality) often improve. Product innovation – Developers and builders in top communities have recognized that to compete with the overhang of “recently new homes” and distressed resales, their product not only needs to be competitively priced, it really needs to be a new product. That means the product is not just new relative to year built, but truly better, with floor plans that better address how people want to live, including better technology, greater energy efficiency, and new spaces in the plans. Product availability – Critical to the success of top-selling MPCs is their ability to provide an inven- tory of speculative homes across multiple price points and orientations. Most buyers are not willing and/or able to wait for a home to be built, but even the best MPCs are still struggling to carry specula- tive inventory as many builders remain cautious. Marketing – Most MPCs report an increase in use of social media as well as finding other innova- tive, cost-effective ways to stay top-of-mind with consumers. All of the most successful communities have taken a careful look at where they’re spending marketing dollars and where they are having the greatest success and have made adjustments, in many cases accomplishing more with less. Strategic Investments – Top-selling MPCs continued to invest in amenities, marketing, program- ming, and maintenance throughout the downturn, which gave buyers confidence and allowed them to capture the buyers that were looking in 2011 and 2012. Lifestyle – As with good quality schools, this major differentiator between the best-selling commu- nities and their competition hasn’t changed since we started our survey in 1994. Buyers choose MPCs because they deliver the right amenities, services, schools, and retail that provide the desired great lifestyle. New business lines – Many MPCs have also creatively sought other ways to generate income, in- cluding expansions into multifamily, business parks, assisted living facilities, and other types of verti- cal development in order to help them weather the downturn. Incentives – Some of the MPCs are offering buyer incentives such as free power for a year and $1,000 gift cards at Bridgeland in Houston, and a year membership at the new Sports and Health Club at Brambleton in Northern Virginia. Helping with financing – Successful MPCs have been helping both builders and homebuyers get credit throughout the downturn. With builders this includes subordinating the cost of the lot until the house is sold, and with consumers it includes items such as credit coaching. Among those MPCs that still cater to first-time or entry-level buyers, credit coaching, coordinated by the builders, has been key to lowering the “bust-out” rate (rejection rate) of first-time buyers seeking credit. The bust-out rate has decreased when credit coaches have been engaged by builders to work with prospective buyers to raise credit scores to acceptable levels. Lending standards are still difficult for would-be homebuyers, and the builders in top-selling communities are helping them get the counsel needed to raise scores. While it’s clear that many of the keys to success in MPCs are similar to what worked in the past (good schools, desirable lifestyle, multiple product lines), there are proactive strategies that developers and builders are employing, as listed above, that have had a substantial impact on their sales success. Our next email article in this series will explore these in greater depth.